2016—it’s been real! But, it’s time to reset, refresh and revamp your wardrobe for your most stylish year yet. Whether you’re looking to make small changes or wipe the slate clean, it’s a new year—so why not find a new style muse? Read on to see our 2017 style muses and how to get the look! 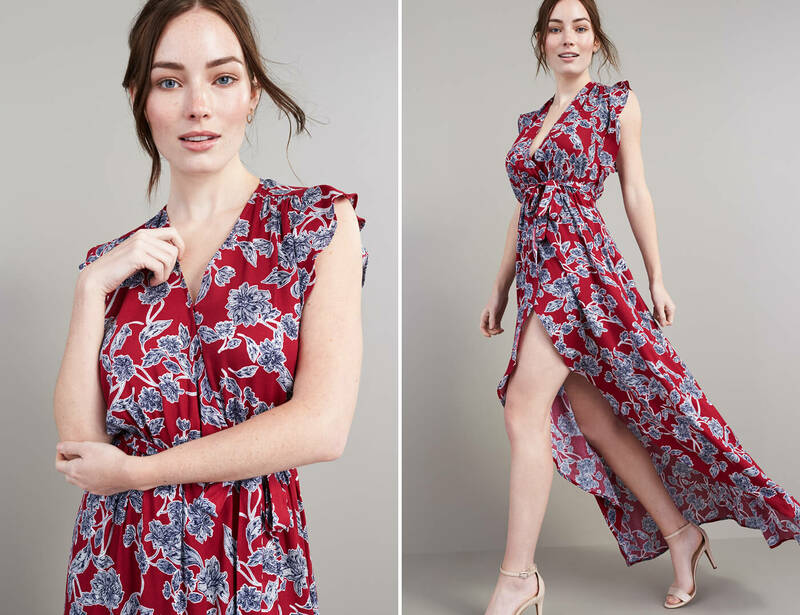 Twirl into the new year in romantic silhouettes like flowy dresses, floor length skirts, cold-shoulder blouses and flirty prints. Details like ruffles, lace and florals keep your style playful—providing an escape from structure. 1. 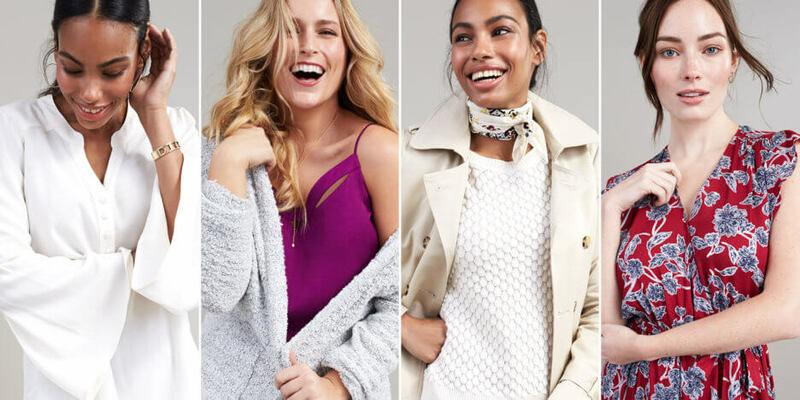 Updated Sweater: Trade in your bulkier sweaters for more feminine (and figure-skimming) styles. Think: an off-the-shoulder knit or a fitted, ribbed sweater. 2. Lace Blouse: Feminine details—like lace—add instant romance to your everyday look. Pretty up your workwear with a lace blouse worn under your usual blazer. 3. Silk Tunic: Dressing up is a breeze with this airy must-have. Just add skinny pants (or even leggings!) for an instant outfit. 4. Floral Dress: You can’t have feminine without florals! Add a printed dress to your 2017 rotation with a flirty, knee-skimming dress—perfect for wedding season. 5. Drop-hem Denim: Even with its distressed edge, it stays feminine with a pair of pumps and a tie-neck blouse. 6. Romper: It’s a one-piece wonder! A romper is the throw-on-and-go staple for spring and summer—plus you can wear them with booties or flats. 7. Suede Booties: 2016 was year of the bootie and it’s not going anywhere! Look for softer, feminine versions like a peep-toe. 8. Denim Jacket: We dare you to find an item this wardrobe workhorse doesn’t pair with. 9. 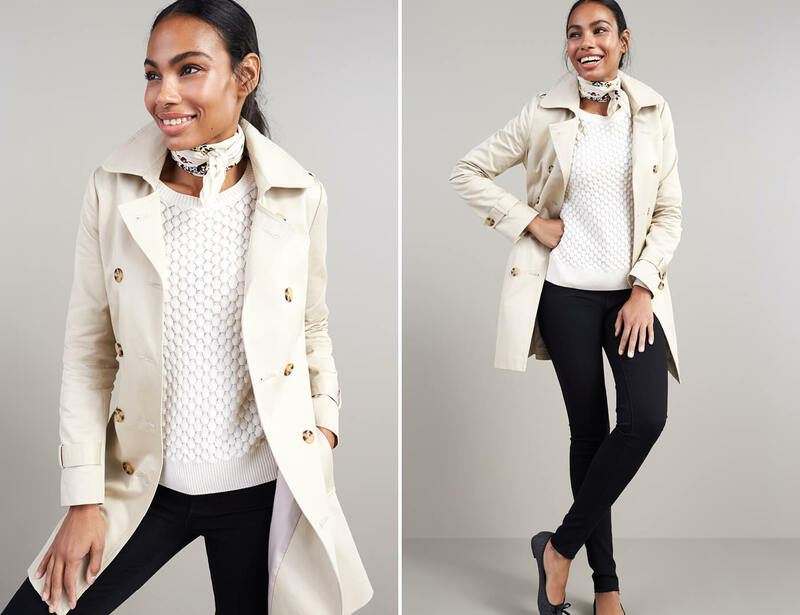 Tie-Neck Blouse: Classic cool is updated with a tie-neck detail perfect for refreshing your office (or daily) outfits in a snap. Greet 2017 head-on in timeless style. Stock up on versatile button-ups, tailored silhouettes and denim that’s not overly distressed. Classic prints and textures—like sailor stripes and cable knits—make a year-to-year comeback for a reason: they work hard and pair well with everything. 1. 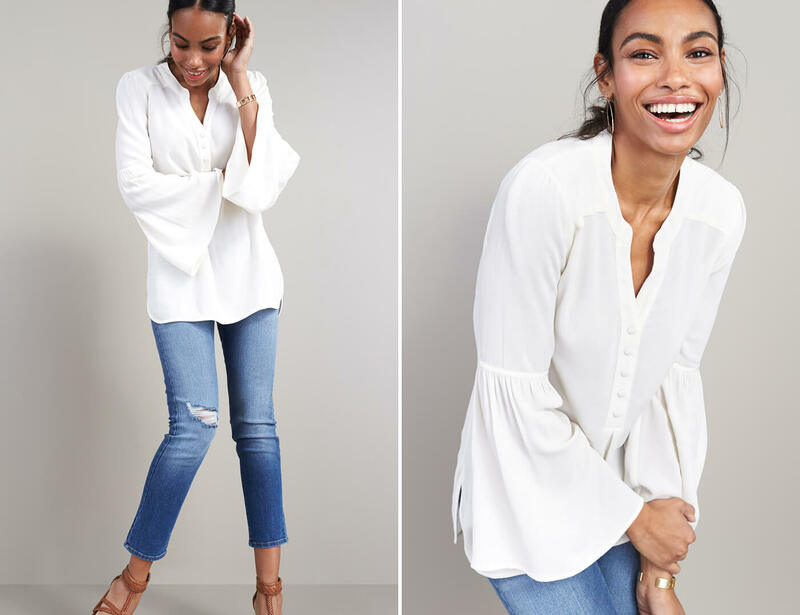 Tab-sleeve Blouse: A classic girl needs a convertible blouse (ahem, tab sleeves) to take to the office or brunch on the weekend. 2. Contemporary Clutch: This can’t-go-wrong clutch is the perfect way to accessorize. Look for a streamlined envelope or foldover clutch this year. 3. Trench Coat: A trench is the one staple that every classic gal must own. Give it a fresh spin in a saturated color to suit your new style. 4. Gem-toned dress: We all own one (or two) LBDs that we rely on. This year, add a gem-toned silhouette into your event dress rotation. 5. Striped Tee: You and stripes go together like fine wine and cheese, PB&J and every other classic combo. Stock up on extra stripes this year—they’re the new white tee! 6. Buffalo Check: A close relative of plaid, a buffalo check print can boldly transition to work with black trousers or weekend in a pair of cropped jeans. 7. Cropped Denim: Give your ankles a little breathing room and let a cropped pair of jeans add an instant update to your denim routine. It’s hands-down the trend to try this year. 8. Bold Blazer: A structured blazer adds polish to every outfit that awaits the new year. Add one in a bright and bold punch of color (or hot white) to promote even your most laidback looks. 9. Cap-toe Flat: Strike the perfect balance between comfort, trendiness and classic styling with cap-toe flats. They offer just a tad more of a finished look than ordinary ballets with every bit the all-day wearability. Minimalists, rejoice! 2017 is your year. Clean lines, simple shapes and grown-up basics are all part of this sophisticated, modern style. Start with a neutral color palette and inject bursts of color to give your look some punch. This style can err on the side of oversized, so if you’re petite, look for body-skimming silhouettes that don’t overwhelm your frame. 1. Green button-up: Modern meets military in a cargo green button-up. Pair it with black denim and white sneakers for a straight-to-the-street style. 2. Convertible Crossbody Bag: Keep it hands-free in 2017 with a crossbody bag in a universally chic camel color. 3. Knit Dress: Go for knit staples that can seamlessly transition from day to night, like a knit dress. Layer it up with tights in the winter or go tights-free in the warmer months. 4. Pleated Skirt: Be bold in 2017 and try a new hue and a new silhouette! The minimalists’ silhouette du 2017? The pleated skirt. 5. Pointed Flats: A pointed-toe flat lies ahead in your fashionable future. These clean, simple shoes pair with all of your skinny jeans. 6. Anything Lace-up: Skip the buttons and go for a lace-up top for a casual day out. 7. Silk Statement Blouse: One rule to always follow: Keep it (super) simple. If you’re looking for an updated spin on a t-shirt and jeans, try a silk blouse instead. 8. Modern Cami: Layering done right. Add a cami in silk, velvet or another on-trend fabric then slip it under an open cardigan. Need to dress it up? Pair with black skinnies and a moto for a modern night-out. 9. Chambray Shirt: Denim-on-denim paired with pointed-toe flats and a convertible crossbody bag is your 2017 style calling card. Free-flowing, bohemian silhouettes can add a breath of fresh air to your 2017 wardrobe. Think: loose gauzy fabrics, pastel and light-colored palettes and #tbt prints. If you’re longing for that boho vibe, you won’t want to shy away from paisley prints, distressed denim or fringe. 1. Fringe Everything: From fringe-hem jeans to fringed sweaters this design detail adds a bohemian sensibility to every outfit. 2. Playful Romper: Bow down to boho in a playful romper (also know as a playsuit). Pair it with your favorite ankle booties for a spring to summer seasonal staple. 3. Open Cardigan: Throw on and flow with an open cardigan in a mixed pattern of soft-and-subtle shades. It’s the perfect after yoga cover-up, too! 4. Boho Tunic: Every boho-gal needs a tunic with a touch of embroidery and tassels. Pair it with tights and ankle booties or layer it over a pair of dark-wash jeans. 5. Ankle Booties: We all know it—booties go with everything. Boho gals should spring for a suede pair with a little bit of detail like a tasseled zipper pull or cut-out details. 6. Printed Blouse: No boho closet is complete without a peasant blouse with statement sleeves and a paisley print. Find one you can wear to work or any weekend event. 7. Lace-up Top: Just like your modern muse counterpart, give buttons a break and go for a lace-up top. 8. Street-chic Jacket: You just can’t box a moto jacket in. Add a little bit of edge to your flowy boho look—just reach for one in a lighter color to keep it fresh. 9. Dark-wash Denim: If you reached for distressed and light-wash denim last year, go for a pair of dark wash jeans to balance out your flowing boho blouses. What style muse do you most identify with? Don’t forget to update your Style Profile to tell your Stylist about your 2017 style resolutions!